The American infatuation with miniature golf peaked in the 1960s and '70s, and enthusiasts on Joan De Arc Avenue had an exceptional variety of unique courses in the Valley from which to choose. 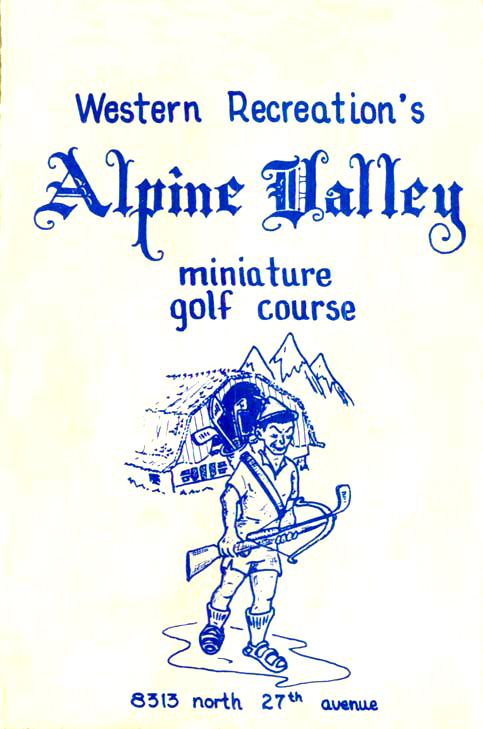 A company known as Western Recreation operated three thematic miniature courses in Phoenix at this time, all of which have long since disappeared into mini links oblivion: Alpine Valley, which was located at 8313 North 27th Avenue; Green Gables, at 2850 North 24th Street; and Hono Lea, at 2410 West Thomas Road. Other '60s courses in Phoenix included Arnold Palmer Miniature Golf and Twin Putt Carpet Golf, both of which were located on the east side of town. For Joan De Arc golfers, though, the preferred choice was always the relatively nearby Alpine Valley, opened in 1960. This charming and cleverly designed course combined an atmosphere evocative of the Swiss Alps with a challenging 18 hole par 49. Each hole had a small sign gracing the tee that featured a cute little Alpine poem containing clues to the best strategy for playing the hole in question. Some of the more memorable holes at Alpine Valley included a Swiss church in the mountains, the requisite turning windmill hole, and a challenging par 4 Swiss chalet that involved up to three separate descending greens, depending on the accuracy of the tee shot. The "19th hole" existed for the sole purpose of collecting the player's ball at the end of the round. The object was to hit the ball up a steep incline and curve it to the right, where a large clown's mouth awaited a skillful shot. A successful attempt was rewarded with a free game, although this was a curiously infrequent experience. Metal grill fencing prevented the ethically challenged sportsman from simply dropping the ball into the clown's gaping maw to snag a free round. Alpine Valley also featured an exceptional game room with some truly excellent old pinball machines for the golfer's post-round enjoyment. The beginning of the end for Alpine Valley and its brethren was the emergence in 1970 of the Putt Putt miniature golf courses, which have since abandoned Arizona completely. Although relatively bland and generic, the Putt Putt courses were extremely popular and provided stiff competition for the Western Recreation courses throughout the '70s. Sadly, the charming, thematic Western Rec courses finally went belly-up in the late '70s, leaving an entertainment dearth in Phoenix that can never be replaced. Many of us will continue to remember, however, those carefree summer evenings in Phoenix when miniature golf truly reigned supreme.